Ready.. 3..2...1... jump. The same words I heard during my bungy jump and also during my sky diving. 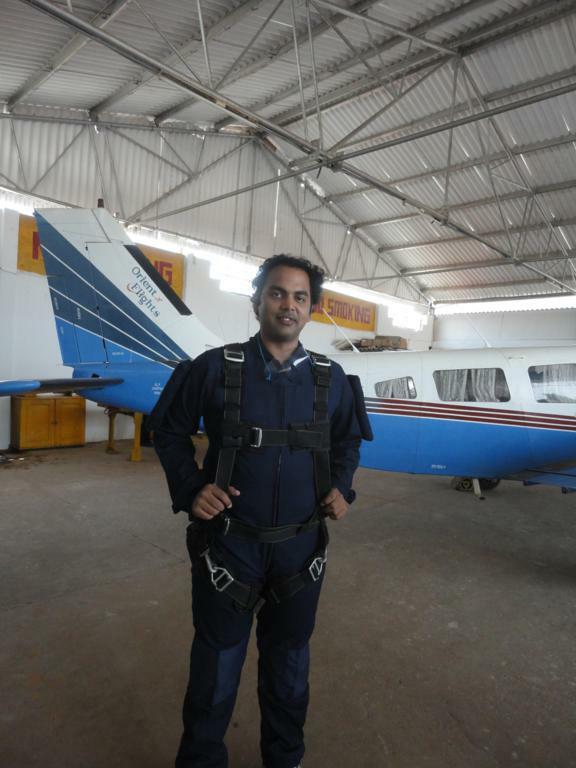 I never though that I will do Skydiving in India. 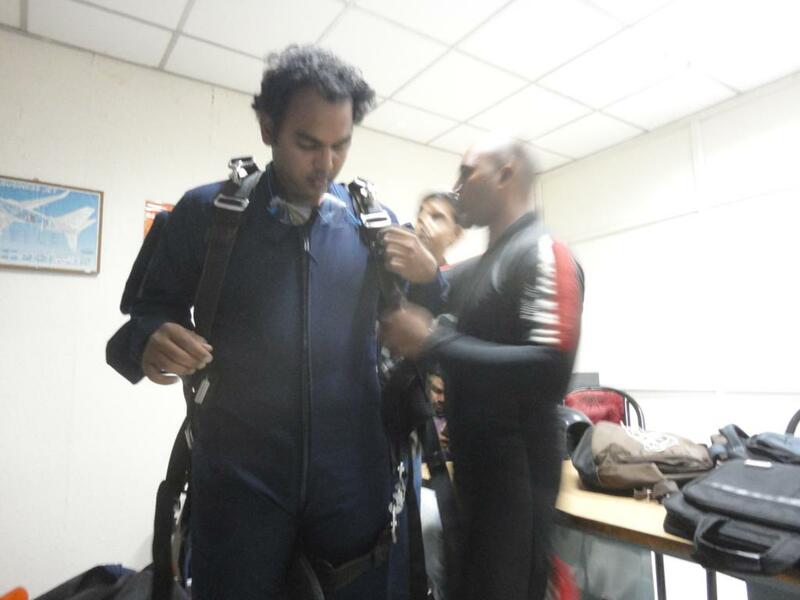 Because of the DreamCatchers and Waitair group, I did my skydiving in Pondicherry on April 29th 2012. Eventhough skydiving is expensive, but still everyone must try this once in their life time. I registered for the tandem skydiving, as I don't have much time to opt for the static line jump which requires 3 days of training and tandem jump is done from an altitude of 10000ft, while static line is done from just 4500ft. As per schedule, I have to report them at 10AM, but the bus got delayed and I reached pondicherry @9AM. So we immediately checked in to the hotel and went to the pondicherry airport. As it was summer season and pondi being located in the coast, the climate was so horrible. 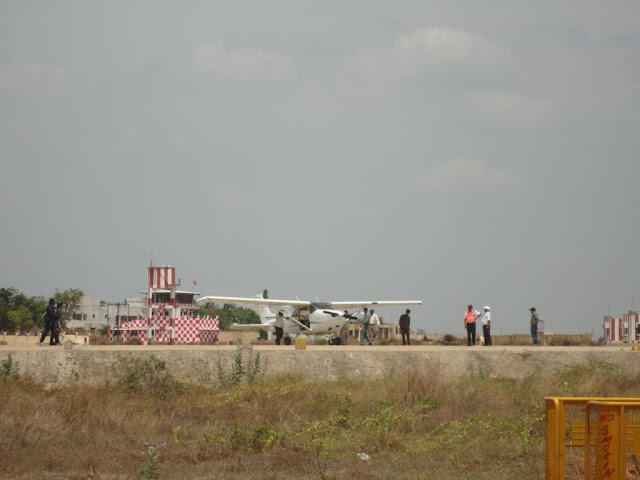 By the time we reached pondi airport, skydiving training class already started and we joined the class in the middle. As I'm the only one who opted for Tandem Jump, they wanted to start dives with me. Instructor gave some training for 60 mins on how to jump, how to get off from the plane, how to balance the body, landing. After that I dressed up with dive suit and went towards the plane. It was my best moment in my life, bcoz I was dreaming about skydiving from many years and I'm about to fulfill my dream. As it was in mid summer, the wind was so heavy and our pilot warned us not to dive. Everyone agreed with pilot and stopped the entire diving for that day. I was very disappointed and went back to hotel. So first day was over without diving. Our instructor asked us to come early, so that I can complete the jump before lunch. The second day we started at around 7AM from our hotel and when we reached airport, no one was there. So we get a chance to take pictures of all the aircrafts and also closely examined some of them. Our instructor came at 9AM and told me to get ready for the jump. But he didn't provided me the dive suit to wear. Here comes the twist in the story. As per the guidelines, the plane has to carry a limited amount of weight, as I'm dressed in dive suit previous day, the pilot had no doubts about my weight, but next day when i'm ready to without suit, pilot has some doubts about my weight. When he asked my weight, as usual I told him wrong figure, Still he didn't believed and he asked the staff to bring the weighing machine. Luckily there is no weighing machine. My instructor some how managed to convince pilot about the weight and started towards the plane. The plane was so small, accommodate a maximum of only 3 persons and no door. I never imagined that I will be seated next to the pilot on plane which has no door!!! It took almost 30 minutes to gain the elevation of 10,000 ft. The views of the pondicherry city and beaches were awesome. After we reached the elevation of 10k, instructor asked me to go outside of the plane and stand on the small platform below the plane wings. My instructor also came outside with me and stood on that small platform. So its time for the jump. I was holding the wings and my instructor asked me to release my hand. I was little scared to release my hand, but I did that and for next few seconds it was free fall, rotating 360 degrees. Almost for 20 seconds, it was a free fall and after that instructor opened the parachute. The free fall is the best part of the jump, I have no words to describe my feelings about the free fall. And the parachute ride after the free fall was also sooo good. 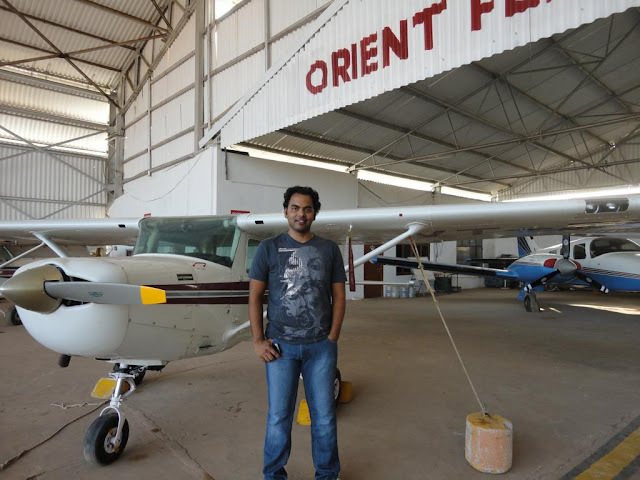 Everything went well before the landing, but because of my fault, I was badly injured during the landing. Instructor told me on how to land successfully, but I didn't followed it. Normally every diver will wear dive suit and knee pads, so that they wont get injured if any thing bad happens during the jump. But I'm not wearing dive suit or knee pads that day and can't escape from the major knee injury. Immediately airport staff did first aid to me. Even though it was a major injury, I didn't feel the pain because I was still under the feeling that my dream got fulfilled after so many years of waiting. I should really thank my friend, who was with me and helped me a lot after that injury. Due to the security guidelines at pondicherry airport, organizers didn't get a chance to film my dive video. But this dive will be a life time experience for me.That's about my dream sky diving adventure. Wow, amazing experience! unforgettable day for your lifetime.